T he Caribbean is a complex maritime environment, with multiple countries and ter- ritories, signifi cant seaborne commerce and a wide variety of threats to safety, security, stability, the environ- ment and sovereignty. A diverse group of stakeholders gathered in Providen- ciales, Turks and Caicos Islands (TCI) to discuss those challenges and reaffi rm their commitment to address them. A major theme throughout the conference was that partnerships and collaboration are important to achieving maritime se- curity in the region. Beckingham, the governor of the Turks and Caicos Islands, an independently governed British overseas territory lo- cated south of the Bahamas and north of Haiti and the Dominican Republic. Among the major challenges to mari- time security are illegal landings sloops packed with people who did not go through proper entry process, Gardiner said. 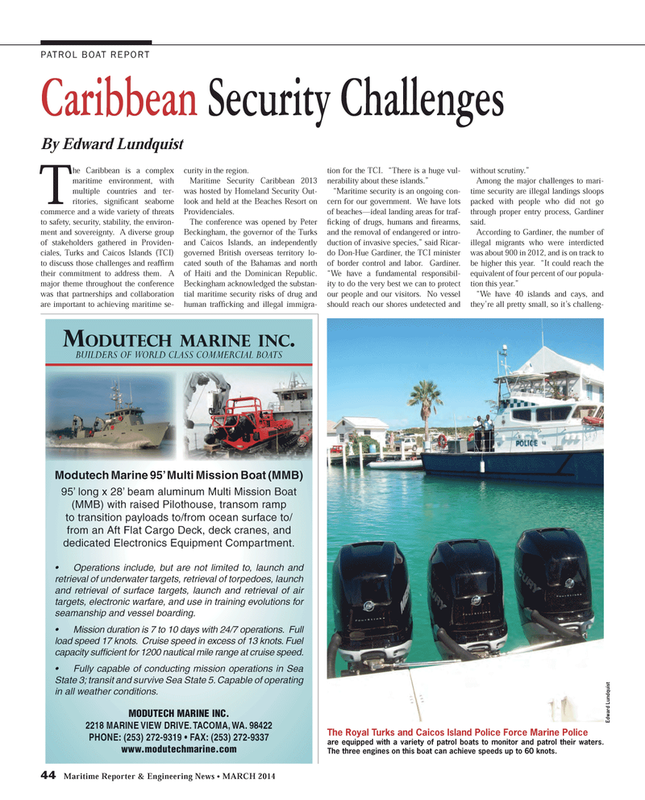 The Royal Turks and Caicos Island Police Force Marine Police are equipped with a variety of patrol boats to monitor and patrol their waters. The three engines on this boat can achieve speeds up to 60 knots.